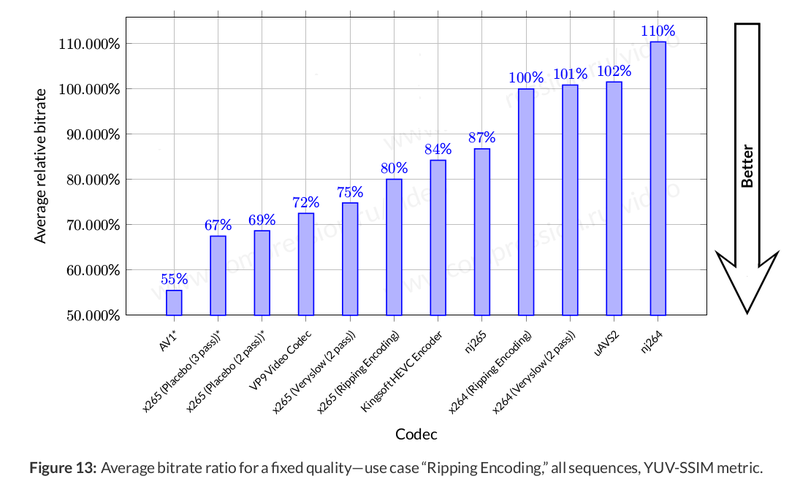 We first covered the Alliance for Open Media’s AV1 video codec in summer 2016, as an open source, royalty-free video codec aiming to replace VP9, and compete or even surpass H.265 capabilities. At the time, everything was pretty new, and when I tried the open source implementation encoding was really slow. Since then, AV1 has gained momentum with for example Apple, Facebook, and IBM recently joining AOMedia, and Mozilla adding HTML5 AV1 video support to Firefox Nightly builds at the end of last year. I was able to play a 720p video @ 800 Kbps almost smoothly in my computer based on AMD FX8350 processor. Many companies want AV1 to succeed since they may not be willing to pay MPEG LA license fee for H.265 and future MPEG codecs (e.g. H.266), and there indeed seems to be issues with the currently MPEG licensing business model. You could also read AV1 specifications for the full details (after building the docs…). There were still a few tidbits easy to understand. First, independent tests – see chart on top – have shown AV1 to offer lower bitrate than H.265 and VP9 implementations in June 2017, and now the results are said to look even better, with a target of 30% better compression compared to H.265. It will also take a while before you get an AV1 camera, as AV1 encoding is currently 2500 to 3000 slower than VP9, but they are working on making it faster.